Fourth Row Center: Film Writings by Jason Bailey: On DVD: "The International"
Tom Tykwer’s The International is not a great thriller, but it’s got one truly great sequence in it, which is nothing to sneeze at—that’s one more than most movies these days. It comes around the halfway mark, and it’s well-prepared. “Our clock has run out,” Manhattan D.A. Ellie Whitman (Naomi Watts) informs INTERPOL agent Louis Salinger (Clive Owen). “If we don’t get this guy right now, it’s over.” Salinger and Whitman’s two investigators tail the guy through the streets of NYC to a rendezvous at the famed Guggenheim museum. What follows inside is suspenseful, tense, and surprising; plainly spoken, it knocks the wind out of you. In that scene, director Tykwer (Run Lola Run) takes what could have been a tired action sequence and makes it damn near Hitchcockian—from the energy of the shooting to the razor-sharp cutting to the way it’s played through to the quiet moment afterwards. Hitchcock’s working method was to start by imagining set pieces like this, and then working with his writers to build a screenplay around them; he famously coined the term “MacGuffin” as an all-purpose descriptor for whatever the plot was about, because it had to be about something (though it didn’t matter what). Hitch treated his “MacGuffin” as a necessary element but nothing to be troubled with; the problem with The International is that it takes its “MacGuffin”—some nonsense about a big bad bank doing big bad things—seriously. The picture’s action scenes certainly play; there’s a purely visual sequence showing an attempted assassination, which Tykwer shoots in tight, beautifully composed close-ups. Later, there’s a terrific bit where Owen and Watts work the scene of that crime, and the construction of that sequence (and their playing of it) is superb. But surrounding those action beats are endless dialogue scenes, most in cold, clean offices and meeting rooms, and most of them are pretty turgid. 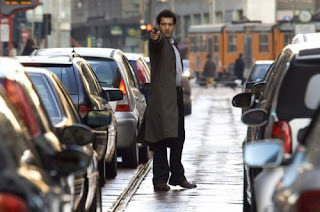 There’s nothing wrong with wanting to make a smart, talky thriller in the John le Carré mold, but Eric Singer’s screenplay can’t get that job done; his dialogue is too stilted (a conversation between Watts and boss James Rebhorn about the nature of truth is groan-inducing), his construction too muddled. Some of the quieter scenes work—like the moodily-lit, understate faceoff between Owen and Armin Mueller-Stahl—but the film plays best when it quickens the pace. Tykwer indulges in some nifty visual tricks, and the score (which he wrote with One Hour Photo composers Reinhold Heil and Johnny Klimek; the trio previously collaborated on the memorable Lola music) helps the film considerably, laying a nervous pulse under some fairly mundane scenes. Clive Owen is becoming the go-to guy for rumpled, unshaven men of action; his work here is strong, and he plays off Watts (who is stuck in a rather underwritten role) well. Their relationship is interestingly done, in fact—it’s purely professional (still an admirable touch in romance-happy Hollywood) and has a life of its own that clearly started before the movie did. So their scenes work, and there are some notable supporting performances—Mueller-Stahl is great (as always), while Brian F. O’Bryne plays his hired killer enigmatically (to good effect). After the Guggenheim sequence, the actual ending seems a little, well, anti-climactic; Singer and Tykwer don’t seem quite sure of how the hell they want to end this thing. To the close, though, the chases and action are slick and well-done. But watch out for the scenes with all the people talking to each other. The International was released to little acclaim and less box-office in February, when Sony attempted to capitalize on the current anti-banking sentiment as a marketing hook. Seen now on the home screen, it misses greatness by a mile, but it is a film of small pleasures—a good performance here, some snazzy photography there. And then there’s that Guggenheim sequence, which really is a show-stopper. "The International" hits DVD and Blu-ray on June 9th.